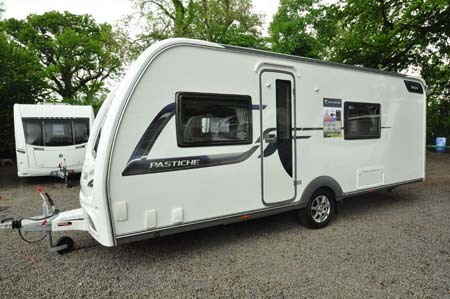 ﻿ Coachman Pastiche 565/4 caravan review - in safe hands! It’s tempting to call the Pastiche range a safe pair of hands, such is its enduring popularity. Top of a six-model line-up for this season, the 565/4 is Coachman’s take on what has emerged as a very popular floorplan across a number of price points. 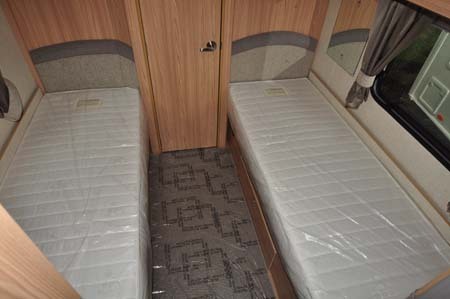 Despite offering accommodation for up to four, this will be seen very much as a ‘van for two who want the luxury to extend to two single beds as well as a full end washroom. But, it appeals to extended families, too, especially where the teenagers then take the single beds, leaving mum and dad to share the double made up from the front settees – and there’s still some privacy for all concerned. Indeed, it’s something of a paradox because the exterior sports the latest look in tourers, with its swooped front and non-opening sunroof, capped off with predominantly black graphics plus alloy wheels. We’ve already mentioned the layout is very much a la mode, but fixtures and fittings represent a more restrained appeal. What that sunroof does do well, helped by the Heki rooflight adjacent, is let loads of natural light in exactly where you want it – at the lounge. It sets the tone for the rest of the living space. That generous 5.80m of overall internal length allows for a decent run of kitchen along the offside mid-‘van. Here, you get a full cooker with dual-fuel hob and separate oven and grill (and, indeed, a pan store). To its left is a sink/drainer combination, with a Thetford 113-litre fridge/freezer below. It still leaves a bit of extra worktop at the outer edges, but not so promising is what’s left over in terms of kitchen storage space. It’s no surprise to see a fitted microwave as standard (although it’s just the sort of fitting that steal valuable locker space, of course). And, overhead, there’s an Omnivent extractor. Heating is Truma’s more powerful Combi 6, with programmable timing. Whereas just a couple of seasons ago this would have been deemed more than sufficient, it’s Alde’s “wet” central heating that’s really taken over in ‘vans of this ilk now. Staying in critical mode, the overhead lockers don’t get positive catches in any form, and some of the plastic mouldings could be a bit sturdier. But this sort of stuff does add weight, of course. There’s a further (smaller) opening rooflight over the two fixed beds, while the beds themselves have a good, supportive feel to them, thanks to sprung mattresses on slatted bases with just the slightest of spring to them. A divider combines with the Venetian blind at the end of the kitchen for that bit more night-time privacy. And the single beds arrangement really comes into its own with the easiest of access to the washroom beyond. 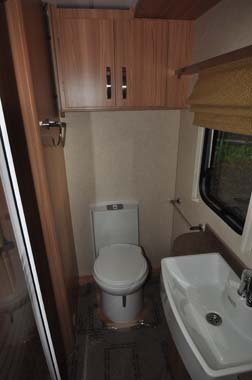 Here, there’s a step-in shower on the nearside, a swivel-bowl cassette toilet on the opposite wall and a fixed sink, Belfast-style, right in the middle. 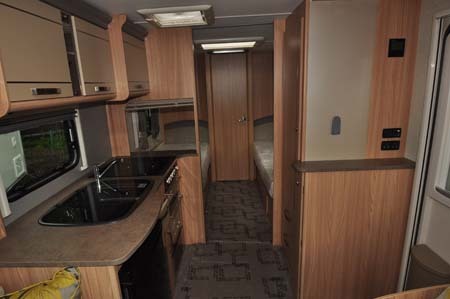 Nevertheless there’s plenty of room for changing etc, even if you have to take into account a short walk to the wardrobe at the foot of the nearside bed. Also, thanks to the quality of the frames, there’s relatively easy access to the under-settee storage by lifting the bases. They’re on struts strong enough to provide proper support when open, too. As ever with Coachmans, the standard kit list is impressive, but that also translates into having to consider heftier than average towcars. Rivals may undercut Coachman on weight (usually) and price (quite often) but the last laugh is always with the manufacturer who boasts that bit extra in terms of overall build quality. There’s more information on the Vision range on the Coachman website and to find out more about our low-cost premiums visit the caravan insurance discounts page. 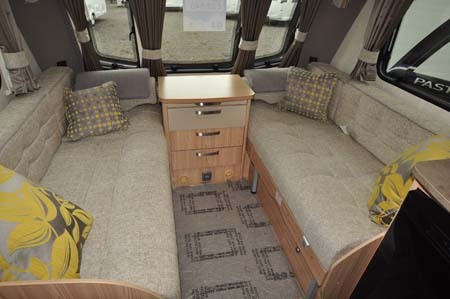 *Caravan insurance cost based on Coachman Pastiche 565/4 caravan retailing at £22,540. Fitted with hitchlock and axle wheel lock. Kept on drive at HX4 0BE. Caravanners over 30 years old, claim free for 3 years and a member of a caravanning club. £100 excess. 180 days European cover and up to £75 per day for up to 15 days emergency accommodation cover included. Legal expenses cover, extended European cover and other emergency accommodation expenses cover options are available at extra cost. Quote includes 10% online discount and 6% Insurance Premium Tax and is correct as of 03/06/2014. Too ‘fussy’ for me. 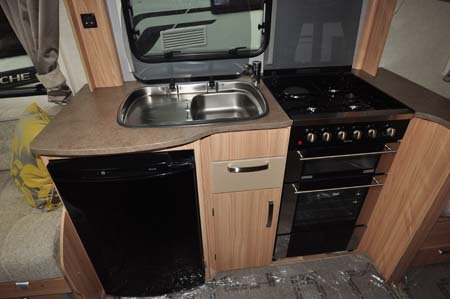 I like my caravans a bit more basic and I really can’t see why you would want to add the weight of a microwave. What’s happened to basic caravanning? 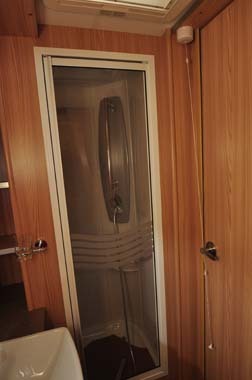 My husband has only just managed to make me get rid of our 30yr old Elddis Mistral (had everything one could want – hot water shower, loo, basin, hob, heating, fridge) and everything was in perfect condition still and all worked. We bought a sixteen year old immaculate Avondale Avocet – and it’s lovely. Noticed a lot of these Pastiches on the site and on the motorway at the weekend. That an Unicorn – they must be good as they are very common, but as I said, not for me. Don’t agree with the first. Agree with the rest. It’s an old peoples van. It isn’t nice to look at,inside or out,decor disgusting,not modern,lacks a lot that other vans already have. Not enough locker space (for 4ppl). The duel hobs about the only modern/stylish thing. Sum up-awfull. we own a coachman amara bit i love this new van really like the twin beds ,but it needs either a pull work space from under the top fridge as the eldis do ,ore lift up from the side of the by the fridge, obvious a man has not tried to dish up on the very small space provided. I love the coachman range,i have a pastiche 530/4 2003 and it is still as good now as it was then,i try my hardest to look after it,but im afraid i could never afford a new one,i love my caravan and go in it as often as i can afford.its great! 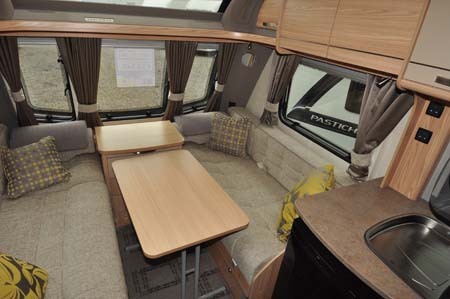 Apart from the non-opening sun roof it seems just like my 2013 Elddis Shamal but does not have the superb BPW chassis and Winterhoff hitch or Alde wet heating (and privacy glass) Both about the same price. I love the pastiche 4 birth and I just know my son and family will love it.